Alain Badiou is perhaps the world's most significant living philosopher. In his annual seminars on major topics and pivotal figures, Badiou developed vital aspects of his thinking on a range of subjects that he would go on to explore in his influential works. In this seminar, Badiou offers a tour de force encounter with a lesser-known seventeenth-century philosopher and theologian, Nicolas Malebranche, a contemporary and peer of Spinoza and Leibniz. The seminar is at once a record of Badiou's thought at a key moment in the years before the publication of his most important work, Being and Event, and a lively interrogation of Malebranche's key text, the Treatise on Nature and Grace. Badiou develops a rigorous yet novel analysis of Malebranche's theory of grace, retracing his claims regarding the nature of creation and the relation between God and world and between God and Jesus. 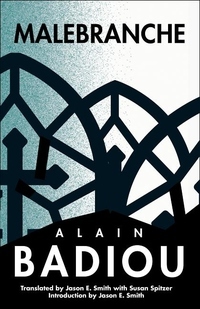 Through Malebranche, Badiou develops a radical concept of truth and the subject. This book renders a seemingly obscure post-Cartesian philosopher fascinating and alive, restoring him to the philosophical canon. It occupies a pivotal place in Badiou's reflections on the nature of being that demonstrates the crucial role of theology in his thinking.